The nurturing of coffee and its agronomic management require high professionalism and dedication. The quality of the product also depends on how the crops are maintained and the cherries harvested. In the case of Colombian Coffee it is necessary to have particular weed management and fertilization models adequate for the necessities of the crops, and a disease and pest control system that is efficient and appropriate. For more information regarding investigations involving these themes, please visit the Cenicafé website. The term weeds refers to vegetation that invades crops, that is, the plants that grow where the agriculturist does not want them to grow and thus limit and interfere with the growth and production of crops. Weeds compete for sunlight, nutrients, water and space. Not all weeds interfere in the same manner with the development of crops. Aggressive weeds that should been eliminated from cropland. Noble or unaggressive weeds that grow around the plant may affect the roots and should be eliminated. But those that grow in the canals may be kept in order to protect against soil erosion. In this way, the coffee trees do not loose nutrients and are able to produce high quality harvests. The total elimination of weeds can cause biologic disequilibrium in the environment and facilitate the emergence of coffee leaf miners, ringworms, and inchworms amongst other pests. Coffee tree fertilization produces better results when environmental and technological demands are adequately satisfied and when organic residuals have been put to their best use. Where should the fertilizer be used? How should the fertilizer be applied? When should the fertilizer be applied? What kind of fertilizer should be used? How much fertilizer should be used? The application of fertilizer never coincides with the harvest periods, but rather maintains coffee farmers busy throughout the periods of the year when the coffee is not being harvested. To control of the principal coffee diseases in the Andes of Colombia is a continuous source of labor and effort for coffee growers. The diseases are caused by funguses, bacteria, viruses and nematodes. The most economically important diseases are: Coffee Rust, Hemileia vastratix: Coffee Wilt and Canker, Ceratocystis fimbriata and Rosellinia bunodes; Brown Eye Spots, Cercospora coffeicola; Pink Disease, Corticium salmonicolor; White Blight, Rhizocytonia solani; Subsequent Stem Dieback, Phoma sp. and nematodes of the Meloidogyne genus. This fungus formally known as Hemileia vastratix, is easily distinguishable by the presence of yellow dust on the inferior side of the coffee leaves. It is a cyclical disease that principally affects the foliage, producing defoliation and damage known locally as "paloteo". It is linked to years of high production with severe epidemics. Within susceptible crops, the disease has caused damages up to 23% of accumulated production, or roughly the equivalent of 1 out of every 4 crops. The foremost method in treating Coffee Rust is by planting varieties resistant to it, such as Castillo. For those varietals which are more susceptible such as: Borbon, Tipica, Maragogipe, and Caturra, the use of preventive fungicides such as Copper Oxicloruro, Cyproconazol or Tiradimefon are required. There are two types of this disease: the South American Wilt, Ceratocystis fimbriata, and Black Root Disease, Rosellinia bunodes. This fungus naturally grows in the soil and has been present in Colombia for over thirty years. It becomes more common when the renewal of coffee trees by pruning their lower limbs, suckers, top branches as well as all the dead, dry or diseased branches from the stem, leaves these wounds unprotected during the rainy season. This disease may lead to the death of the coffee tree. In severe attacks the density of the plants may be reduced by 20% to 40%. 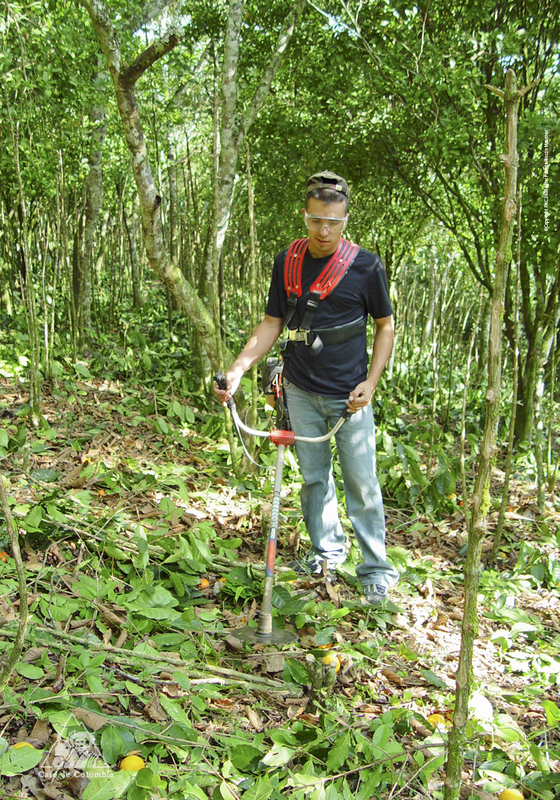 It is recommended that all tools be disinfected, and that all coffee tree wounds be treated with fungicides. This is the most common coffee disease in Colombia. It is caused by the Cercospora coffeicola fungus. The disease affects coffee trees throughout their entire lifespan, from the time their cotyledonary leaves sprout to the time that they produce fruit. Brown Eye Spots are characterized by small reddish brown to dark brown circular spots. The disease can cause permanent loss of foliage and hence increase the probability to produce poorer coffees. Those coffee trees that are fully exposed and poorly fertilized are the most susceptible. The control is basically preventive. There are no known cures once the disease attacks. Sick trees are entirely removed and be exposed to direct sunlight for at least three months. Today there are over 100 recognized species of insects that live in harmony with coffee trees. Only three of these represent an economic impact: the coffee berry borer (Broca in Spanish), Hypothenemus hampei, the coffee leaf miner (Minador in Spanish) Leucoptera coffeellum; and mealybugs (Palomilla in Spanish), Dysmicoccus spp. The Coffee Bean Borer, Hypothenemus hampei or "Broca"
This pest has caused the most damage to coffee throughout its entire history. It was first recorded in Colombia in September 1988 and has caused enormous losses in every coffee growing region of the country. This borer directly attacks the coffee cherries affecting the volume and quality of production. 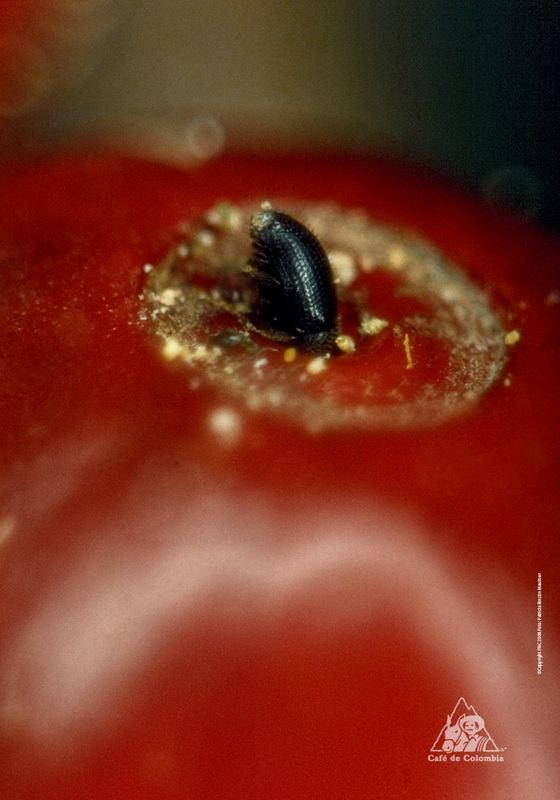 This pest is very difficult to manage with the use of traditional control methods, such as insecticides, because it remains protected for the majority of its lifespan within the interior of the cherries. However, some adult borers are susceptible to sprinkling of these insecticides yet only when they come into direct contact. The coffee bean borer is a tiny black insect, and the size is like of a pin's head. It is very harmful because when it attacks it perforates and damages the beans in order to feed itself. It is a pest that originates its attack from within the green cherries of the coffee trees three to four months after they have bloomed. There are various methods to control this pest, of which the foremost method is known as the integrated method to manage coffee bean borers. This method consists in a cultural control that includes the full control of the beneficio process, the timely harvesting of the coffee cherries at the time of their maturation and the biologic control by using wasps and fungi. Wasps are bred and then released within the coffee crops so that they may become established and eat a portion of the borers, by seeking them within the cherries. The recommended fungus is a white mildew that is sprinkled amongst the coffee crops in order to destroy broca infestations. This method has permitted Colombia to sustain low levels of infestation within its coffee crops to comply with its export obligations in terms of productivity and quality. The coffee berry borer expands to other plantations via various methods: through the half-hazardly manual dissemination of affected seeds and cherries, i.e. by brushing off cherries attached to clothes, hats, shoes, tools, vehicles or equipment such as machetes (a kind of sword), sacks, or baskets, or via the runoff from washed cherries. This is a very damaging pest that principally affects the photosynthetic region of the coffee trees and causes defoliation, thus obliging the use of insecticides by coffee growers in lower elevations. This pest only attacks the Coffea genus. Diploid species such as Coffea stenophylla have been found to be resistant to this pest. The damages are incurred during larva stage, when the coffee leaf miner devours 1.0 to 2.0 squared centimeters of foliage throughout its evolution. The leaf may suffer necrosis of up to 90% of its structure if several larvae cohabitate the same leaf. The principal factors related to attacks by the coffee leaf miner are: renovation of coffee crops, exaggerated weed control, use of less than the minimal recommended dosage of insecticides or agrochemicals during dry seasons and particularly at elevations under 1,300 meters above sea level. Before making any type of chemical control, environmental controls are evaluated, while keeping in mind that the rainy season drastically affects the coffee leaf miner populations and bring many natural predators, such as: Neuroptera crysopa sp. as well as Polistes and Polibia Wasps in addition to parasites such as Closterocerus coffeellae, Horismenus sp. and Tetrastichus, amongst others. There are several species: Dysmicoccus alazon, D. brevipes and D. criptus that are generally associated with the Septobasidium fungus and ants of the Solenopsis genus. The colonies originate from seedbeds, where they affect the base of the coffee tree's stem and in the field where the mealybug population freely multiplies and is protected by ants. The external symptoms are similar to those produced by a Wilt and Canker infestation, which result in the rapid aging of the coffee tree. Control of the mealybug is mainly preventive as once mealbug lots become established within the coffee tree it is very costly to manage, and in many cases it is better to simply replace the infested trees. Nonetheless, blends of insecticide with 0.2% to 1% agricultural oil can be applied directly to the base of the affected stems in efforts to manage the infestation. For many years coffee was stored without the risk of becoming infested. The only pest that was at that time known to attack coffee from an economic and qualitative point of view was the Coffee Weevil,Araeceru fasciculatus. With the arrival of the Coffee Bean Borer pest infestations became more predominant and new species like Cryptolestes ferrugineusmade an appearance. The Coffee Weevil is found within coffee crops attacking dry cherries. These beetles are common wherever low grade coffee is stored, and commonly multiply within sacks of lower grade coffee or coffee sacks with less than 13% humidity. Pest control is a necessary part of integrated coffee management at warehouses, and essential in order to avoid any complaints and preserve the traditionally great quality of Colombian Coffee.